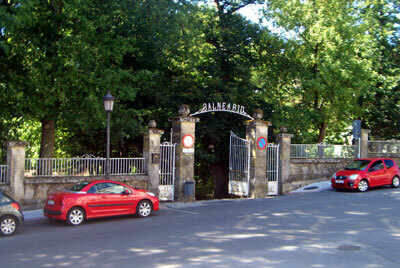 One of the features of O Carballino is its large municipal park (Parque Municipal) to the south west of the town, which was established around one hundred years ago. The park is indicative of the towns development and status and, in addition to normal recreational use, also hosts a large festival celebrating pulpo (the octopus). This festival takes place on the second Sunday of August and it is a very popular annual event attended by thousands of locals. Back to the park itself and features include extensive forest areas and a river (Arenteiro). 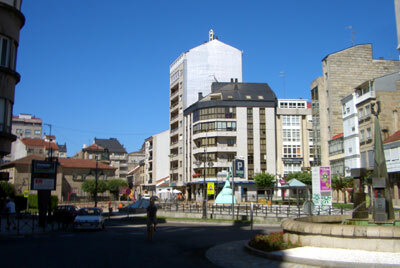 The park is also bisected by several streets and avenues including the Vigo Avenue and the Avenue Arenteiro. The forrest has many different tree types, however pines and numerous deciduous trees like the oak are the most commonly occurring varieties. Within the park there is a Spa (not the mineral Spa referred to on the previous page), a recreational zone and a farm and there is also a residential development. At various times of the year a bandstand appears and a statue commemorating two brothers, the Prietos who were patrons of O Carballino, is also present. Recent developments of the park include a new museum situated on the left side of the river (Ethnographic Park Museum) and there is a paper mill along with a reconstruction of what once would have been the miller's house. Naturally the park has well developed picnic areas and recreational zones (always the case in Galicia). 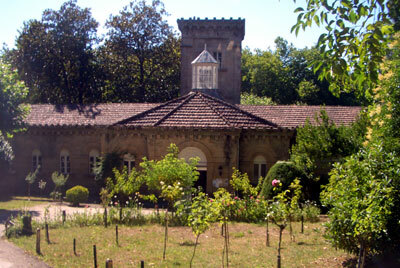 Left, This is the thermal and mineral water Spa on the edge of the town (referred to on the previous page). Just outside of O Carballino there is a monastery church which is described as being one of the best Cistercian temples in Europe. Its cloisters date back to the sixteenth and eighteenth centuries. There is a photo of it on our first O Carballino guide page. Another place worthy of a visit is the Sanctuary La Saleta. From this spot there are some great views looking across the valley Arenteiro. In Esgueva there is the remains of a necropolis or ancient burial ground. Above right, This is the main entrance to the Spa. You do of course have to pay in order to enjoy the waters and use the facilities. 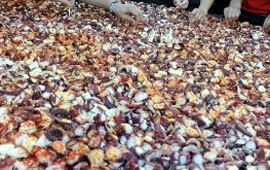 The big fiesta in O Carballino is the one that celebrates the octopus, called pulpo in Galicia and Spain. 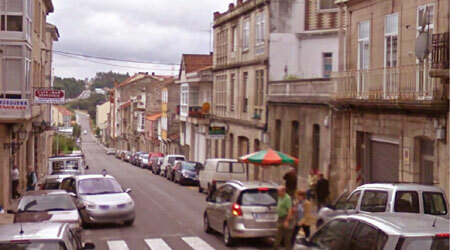 This fiesta is celebrated throughout Galicia and it is enjoyed with great enthusiasm and a lot of eating and drinking. Throughout the festival the eating of pulpo is of course at the fore and, although served in various dishes, the most popular way of eating it is boiled (in copper kettles) and cut up into bite sized pieces and seasoned with olive oil and paprika. It is served on flat wooden dishes. Make shift street cafes are set up specifically for this boiled pulpo dish and the whole octopuses are cut up using scissors once cooked. Bread is eaten with it as an accompaniment. As previously mentioned, this festival takes place annually on the second Sunday of August and it is attended on mass by the population of O Carballino and the neighbouring towns and villages. Just to try and give you a bit more of a feel for this town, I would add that it comes across as modern and business like rather than quaint and "touristy". You can enter the town on a couple of main routes and, as you leave on one of them, you drive through a suburb which, in Britain, we would describe as the "stock broker belt". In other words it is very prosperous with large houses of almost mansion like proportions. Right, a random photo showing the central area of the shopping and business district.